Besalú, medieval town which was a fortress between two rivers: the Fluvià in southern and Capellades in the north. The origin of the town was the castle of Besalú which is already documented in the tenth century, built on a hill where the remains of the canon of Santa Maria in the High Middle Ages. It is a historic-artistic since 1966, thanks to its great architectural and the discovery of Mikva, ancient Jewish bath, which is unique in Spain and the third discovered in Europe. 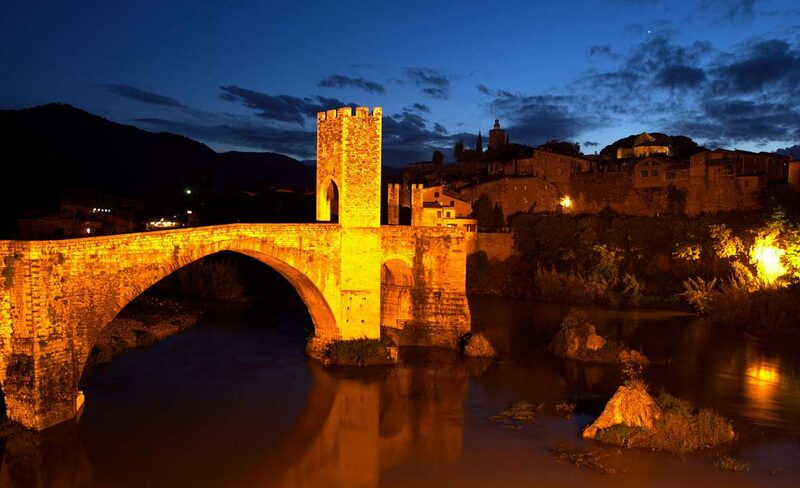 In the picture you can see the Besalú bridge. Founded in the eleventh century, is a bridge of seven arches and characterized by having angular due to the settlement of the foundations of natural river stones. Is 105 meters long and 30 meter in height including the tower of defense. It was bombed during de civil war and later rebuilt. Today is the symbol of the town.